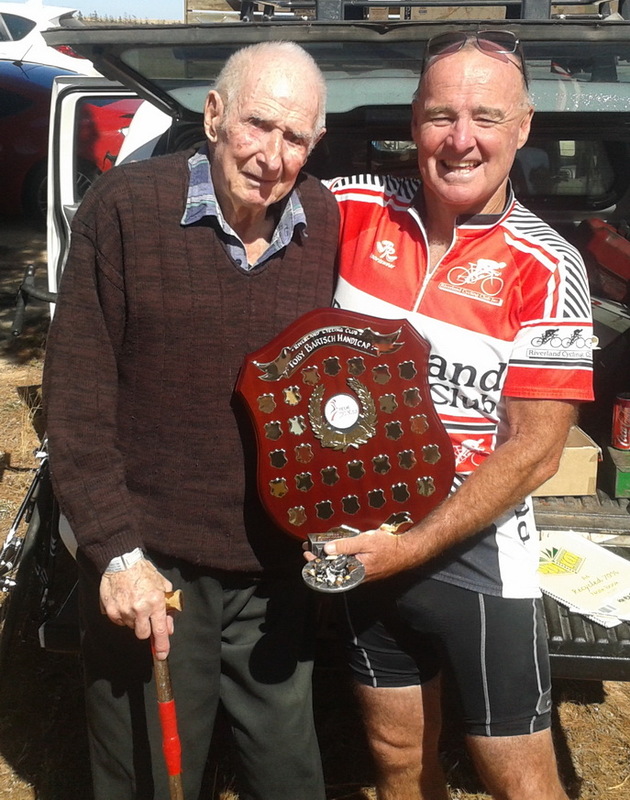 Conditions were overcast & moderately windy in Loxton this morning for that inaugural Toby Bartsch handicap. Toby Bartsch was there to greet all the riders at the start & stayed for the duration of the event to greet the riders home. Impressive numbers for this event with 15 local riders turning up. All eager to have a crack at the Toby Bartsch trophy for the first time, this race was formally the Loxton Traders handicap race. Handicaps were as follows; Brailey Jachmann on limit to start us all off. Followed by Peter Weston at the 7 minute mark. Followed by Mick Gray, Peter Burr, Lee Rasheed, Glen Obrien, Dennis Robinson & Lee Stevens all in the one bunch starting at 17 minutes. Chopping block group made up of Angus Boase, Peter Schammer & Shane Pitman would set off at 21 minutes. Scratch set off at 25 minutes & was made up of Colby Jachmann & Mathew Benson. All these groups would complete 2 full laps of the Loxton course giving them a race distance of 45kms. Gordon Lawton also started at the 25 minute mark & would complete a race distance of 32km�s. Tyler Stevens accompanied by his grandfather Roy Stevens would complete 1 full lap giving him a race distance of 22.5kms. He started at the 44 minute mark. Well what a race! Glen Obrien was the first victim from his group. He was spat early by his group which was riding hard to stay away from scratch. Dennis Robinson was the next victim from his own group. Lee Rasheed would suffer the same fate about a lap later. Lee Stevens, Peter Burr & Mick Gray were doing all the damage riding hard & chasing down all that were in front of their group. Scratch caught chopping block on the second lap approaching the rise near the silo. Pitman was the only rider from his group to hook onto the motoring scratch group. Boase & Schammer missed the jump. However Pitman would suffer the same fate as Boase & Schammer just at a later time! Scratch now gathered up & passed Brailey Jachmann & Peter Weston. They then proceeded to chase the groups in-front of them hard. Burr�s group with Gray & Stevens in it, caught & passed Gordon Lawton & then Tyler Stevens before they rounded the last turn for the home straight! However scratch had disposed of Pitman just after the railway line, were moving in for the kill! Scratch caught the now lead group of Burr & Co with only a few km�s to go. Benson attacked but could not dislodge the riders in tow. The group then settled in readiness for the sprint to the line. With everyone looking at each other to see who was going to do what. Mick Gray decide to have a crack at taking out the first Toby Bartsch handicap, take it out he did! The rest of the group gave the old war horse too much of a head start in the sprint & he rode away from everyone to take the victory! all finished in the main sprint. It was truly a great win by Mick Gray. He was very humbled & honoured to take out the Toby Bartsch handicap. I would like to thank Toby for attending & providing lunch afterwards. Toby also gave a donation which went towards the prize money for the riders. Special thank you to Brenton Woon for providing the trophies for the event. It was a great day & awesome handicap race which anyone could have won!